Mix brown sugar, water, vinegar, ketchup, soy sauce, and sliced onion in a small bowl. Mix cornstarch with just enough water to form a paste and add it to the sauce mixture, mixing well. Place cubed chicken in the slow cooker and pour sauce mixture over chicken. Cook in the slow cooker on low for 3-4 hours or until done. I have an unusually large sweet tooth so if I can sneak a little sweetness into my dinner, that’s a score in my book. This Slow Cooker Sweet and Sour Chicken has a just enough sweet flavor mixed with a little sour tang that I love. 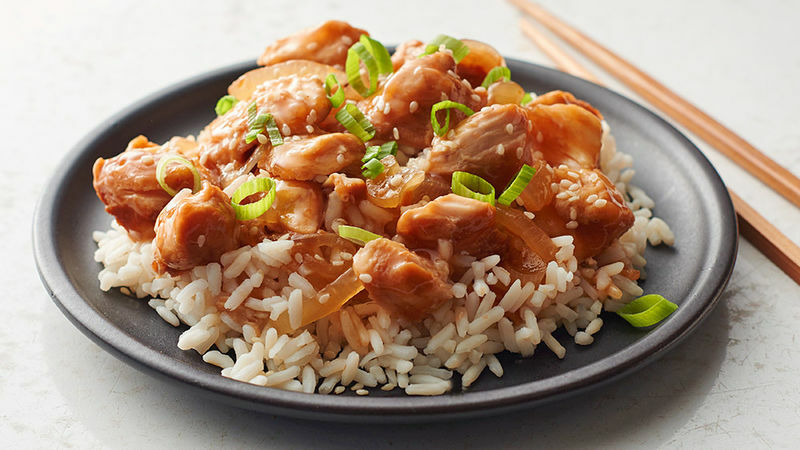 Not only can you have take-out style sweet and sour chicken, all the work is done for you in a slow cooker, which means your house stays cool, too. Not to mention that it’s a much healthier take on the classic -- no frying here. Every ingredient plays a small role in creating the distinct flavor of this dish. Another plus is that this is one of those meals that most likely you will have all the ingredients already available in your pantry. Huge bonus! Because c’mon, let’s face it…I would rather eat cold cereal for dinner than have to drag all three of my kids to the grocery store when it’s not necessary. After cooking in the sweet and sour sauce all day, the chicken turns a beautiful caramel color. Serve it over white rice for a filling and easy dinner. Mix it up Tired of cooking with chicken? Add a little variety and try this with pork! Keep Your Cool Don't start the oven if you don't have to in the summer months! With great slow cooker recipes, you can have a fab meal without the heat.